Barry Levinson is no stranger to serious themes in his films–he has taken a look at such always-timely topics as immigration, assimilation, war, and mental illness. Now, his self-described “film essay” Poliwood takes on the political process at the point where, you guessed it, Hollywood and politics intersect. More specifically, the film centers on the Creative Coalition, which bills itself as a non-profit, non-partisan group of celebrities that gets involved in politics in order to bring awareness to issues that resonate with them, like arts education. 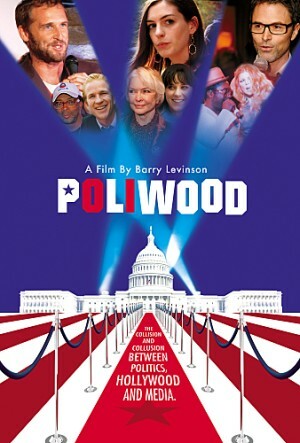 Celebrities such as Tim Daly, Anne Hathaway, Susan Sarandon, Ellyn Burstyn and others attend both the Democratic and Republican National Conventions leading up the 2008 inauguration of Barack Obama, and Levinson follows them to find how mass media plays a role in the process. The “celebs in the political arena” topic has been covered extensively, of course, but Levinson’s entertaining and informative take is a viable one. He gets across a real feeling of going behind the scenes with these celebs, who come off like passionate, outspoken regular folks. Sure, two-thirds of the film focuses on the Democratic convention, which is to be expected from the liberal hotbed that is Hollywood, but it seems the Creative Coalition really does strive to be unbiased and open to discussion. Actors like Hathaway (pictured) are particularly interesting, as she details how frustrating it is to want to be involved in politics, but it’s impossible to separate that from her life as a movie star when journalists won’t distinguish between the two. Supplements include additional and extended interviews with talents Mos Def, Steve Earle and Ani DiFranco, along with Arianna Huffington. There’s also a piece focusing on readings from “The Courage Show,” a gala put on by the Coalition following Obama’s election.